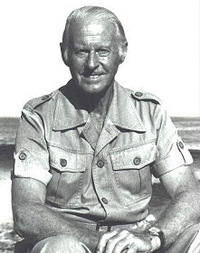 Thor Heyerdahl (October 6, 1914, Larvik, Norway – April 18, 2002, Colla Micheri, Italy) was a Norwegian ethnographer and adventurer with a scientific background in zoology and geography. Heyerdahl became notable for his Kon-Tiki expedition, in which he sailed 4,300 miles (8,000 km) by raft from South America to the Tuamotu Islands. All his legendary expeditions are shown in the Kon-Tiki Museum, Oslo. Thor Heyerdahl was born in Larvik, the son of master brewer Thor Heyerdahl and his wife Alison Lyng. As a young child, Thor Heyerdahl showed a strong interest in zoology. He created a small museum in his childhood home, with a Vipera berus as the main attraction. He studied Zoology and Geography at University of Oslo. At the See also ثور هايردال. Thor Heyerdahl was born in Larvik, the son of master brewer Thor Heyerdahl and his wife Alison Lyng. As a young child, Thor Heyerdahl showed a strong interest in zoology. He created a small museum in his childhood home, with a Vipera berus as the main attraction. He studied Zoology and Geography at University of Oslo. At the same time, he privately studied Polynesian culture and history, consulting what was then the world's largest private collection of books and papers on Polynesia, owned by Bjarne Kropelien, a wealthy wine merchant in Oslo. This collection was later purchased by the University of Oslo Library from Kropelien's heirs and was attached to the Kon-Tiki Museum research department. After seven terms and consultations with experts in Berlin, a project was developed and sponsored by his zoology professors, Kristine Bonnevie and Hjalmar Broch. He was to visit some isolated Pacific island groups and study how the local animals had found their way there. Just before sailing together to the Marquesas Islands in 1936, he married his first wife, Liv Coucheron-Torp (b. 1916), whom he had met shortly before enrolling at the University, and who had studied economics there. Though she is conspicuously absent from many of his papers and talks, Liv participated in nearly all of Thor's journeys, with the exception of the Kon-Tiki Expedition. The couple had two sons; Thor Jr and Bjørn. The marriage ended in divorce and in 1949 Thor Heyerdahl married Yvonne Dedekam-Simonsen. They in turn had three daughters; Annette, Marian and Helene Elisabeth. This marriage also ended in divorce, in 1969. In 1991 Thor Heyerdahl married for the third time, to Jacqueline Beer (b. 1932). Thor Heyerdahl's grandson, Olav Heyerdahl, retraced his grandfather's Kon-Tiki voyage in 2006, as part of a six-member crew. The voyage, called the Tangaroa Expedition, was intended as a tribute to Thor Heyerdahl, as well as a means to monitor the Pacific Ocean's environment. A film about the voyage is in preparation.